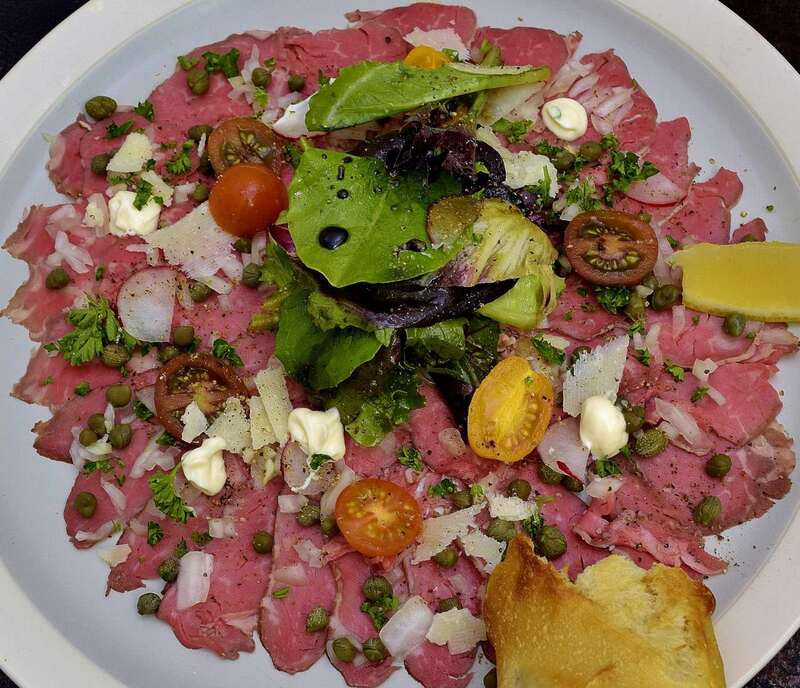 Carpaccio is a raw beef dish named after an Italian painter who favored vivid red shadings. Sous vide pasteurization adds a layer of safety. Seen above: The entire tenderloin, fully denuded. Do not be intimidated by the prospect of trimming this cut yourself–butchers will not tell you that it is one of the easiest cuts to clean–but it is–to know more, click HERE. Beef tenderloin, 3-4 oz/90 g-120 g.
Onion, chopped very fine, 1 oz/30 g.
Parmigiana Reggiano, 1 oz/30 g.
Aioli/garlic mayonnaise, a few drops. Extra virgin olive oil, a few drops. Field Greens, 1 oz/ 30 g.
Balsamic vinegar, a few drops. Mechanical slicer or slicer knife. Stage the tenderloin into a dedicated vacuum bag. Seal and sous vide process for four hours. This will pasteurize/preserve the protein. Submerge the unopened package in iced water until 70 F/21 C is achieved–this usually takes about 15 minutes. Remove the tenderloin from the bag and discard or save the juices. 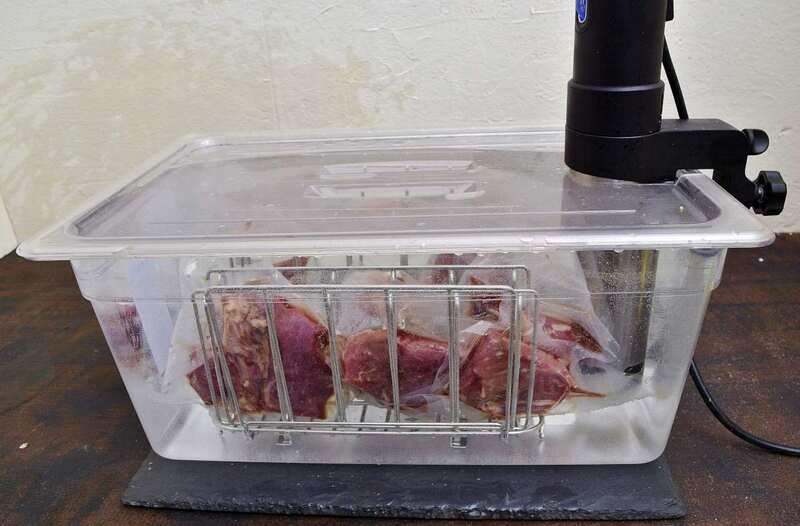 FREEZE the tenderloin until it achieves approximately 15 F/-9 C. Chefs do this routinely to make the beef slice-able, either manually or mechanically. The alternative is to put 40 F/4 C slices of the beef between sheets of plastic wrap and then tap with a wooden mallet until they are the desired thickness. They are then frozen until service so that they can be easily removed from the plastic. There are other ways to accomplish this–these are the easiest that I have come across. Refrigerate a large plate until it achieves 40 F/4 C. Set on a work space and start by slicing one piece of the beef. Check to make sure that it is the thickness that you want and place it just inside the outer rim of the plate. 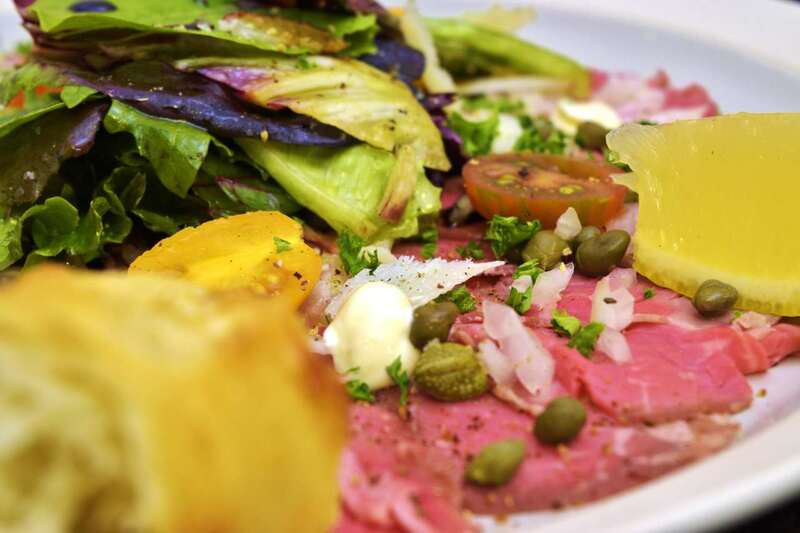 Arrange each piece of beef on the plate as you slice them, one by one. They should just touch each other, but not overlap. This will make a huge difference in the final appearance of the dish–the meat should look flat like a painting. The other ingredients are intended to evoke the relief that the artist created by applying thick brush strokes of paint to his work. Continue slicing and placing until the plate is fully covered except for a reasonably wide rim. Sprinkle the Kosher salt,, capers and chopped onion uniformly over the entire surface of the meat. Arrange the cherry tomatoes and sliced radish around the plate, but not in the center. Combine the field greens, extra virgin olive oil, balsamic vinegar and a pinch of salt; toss well. Form into a tight ball and place in the middle of the plate. Use a mandolin or a vegetable peeler to slice the Reggiano Parmigiana over the surface. 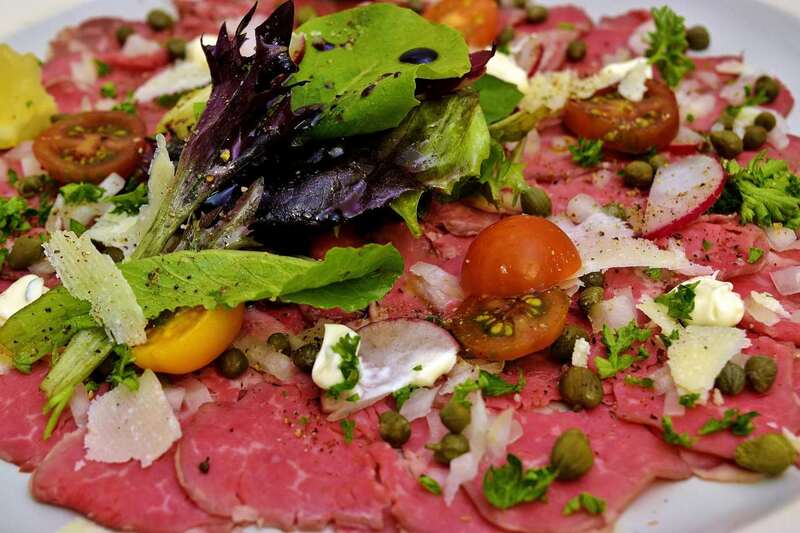 Grind black pepper over the Carpaccio. Place a few tiny drops of aioli on the surface as well. Place the lemon wedge and a small section of bread on the rim and serve immediately. This is a truly unique dish. Somehow, the Italians have synergized their cuisine to include an almost sushi-like characteristic. 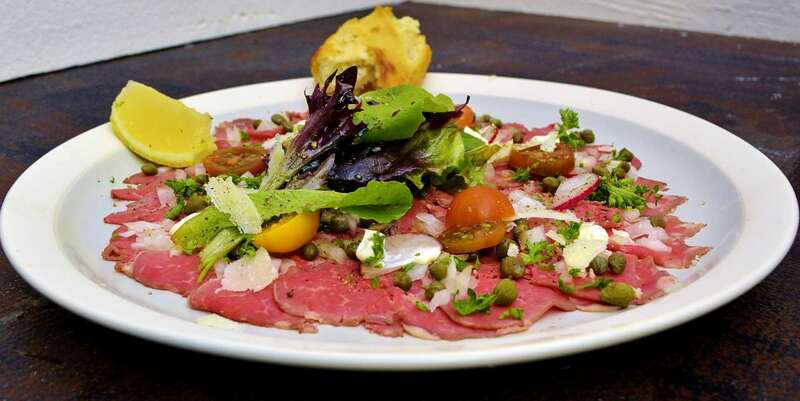 Many people consider Carpaccio to be an ancient, classical dish, even though it originated in Venice circa 1950. 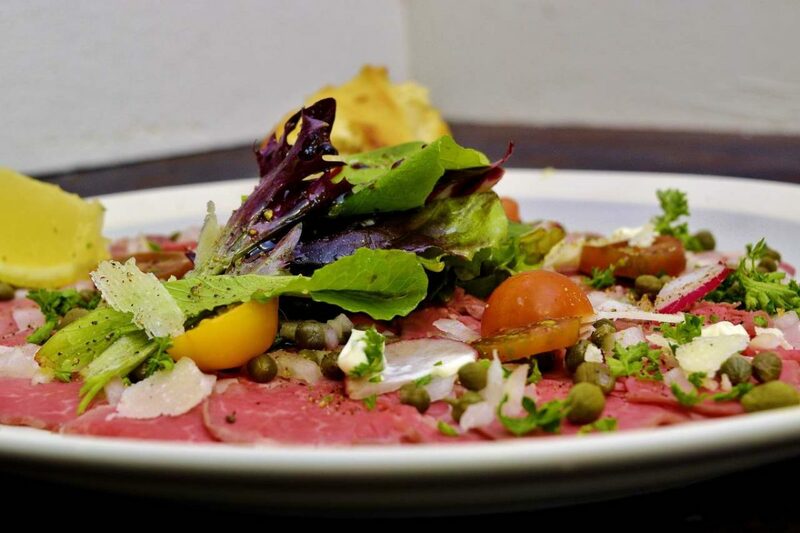 Conceived using raw beef, the Italians themselves now attach the name to almost anything that is somewhat red and sliced extremely thin--ahi tuna, octopus, salmon, even beets and other vegetables. Sometimes the products used are not even red and the loose definition becomes simplified to merely indicate the mere thickness. By contrast, many Americans interpret the term much more strictly and scoff at the idea of using anything other than beef. We will avoid controversy by utilizing sous vide processed tenderloin--pasteurization eliminates the occasional concern for food safety.